To help create a thriving, vital community by developing opportunities, programs and initiatives that enhance the quality of life for residents of Benton. The Benton Community Development Corporation (BCDC) is a community-based, service organization dedicated to helping build a better community, while preserving the flavor and uniqueness of Benton. Taking a proactive approach to help ensure the town’s long-lasting success, the BCDC designs and implements a variety of strategies, programs, and initiatives that benefit the residents and businesses of Benton. The BCDC was founded in April 1992–spearheaded by Keith Farrey, who served as Benton’s Village President from 1991 until his death in 1999. Keith’s vision for the future of Benton was the driving force behind the inception of the Benton Community Development Corporation—a vision that still drives the organization today. BCDC meetings are held at 6:00 P.M. each month. Over the past 15 years, the BCDC has completed many service-related projects that address our mission of helping to create a better community. The list that follows outlines some of the projects that are currently being undertaken, as well as listing a sample of some significant projects that have been completed. Benton Business Incubator. The largest project undertaken to date is the building and management of the Benton Business Incubator, a coordinated effort between the Village of Benton and the BCDC. Located at 244 Ridge Avenue on the west edge of Benton, the business incubator is a 12,800 square foot facility built to nurture start-up companies and entrepreneurs during their first few critical years of business. The business incubator offers small and medium-sized start-up businesses office, warehouse, commercial, and manufacturing space at low, affordable monthly rates. Additionally the incubator provides a variety of business-assistance services and resources that are beneficial to successful growth. For additional information about the Benton Business Incubator, please call the Village Office at (608) 759-3721 or email [email protected]. The Keith Farrey Memorial Scholarship and the BCDC Scholarship. Each year the BCDC awards two scholarships to Benton’s graduating seniors—the Keith Farrey Memorial Scholarship and the BCDC Scholarship. Both scholarships are partially funded by proceeds from the annual Tree of Love Ceremony in which memorial ornaments are purchased to honor family members and friends. The ornaments are hung on the memorial tree during the tree-lighting ceremony in December. To donate to the either scholarship fund or to purchase a memorial ornament, click on the online link to the Benton Community Voice. Benton Community Voice. The Benton Community Voice is a free community newsletter published three times a year by the BCDC. The newsletter has always been mailed to Benton residents and all Benton High School graduates; however, for persons having Internet access, the Community Voice is now available via email attachment. Electronic methods are more cost-effective ways of distribution, resulting in substantial savings that can be used for additional community projects. Please let us know if you would like to receive your newsletter electronically, and we’ll remove your name from our regular mailing list. If you choose to receive your newsletter via email, your name may be added to the email group list by contacting Rose Walton at [email protected]. Please include your name, address, and the email address to be used for the group list. For those not having Internet access, the Community Voice will continue to be mailed as it was in the past. Benton Website. 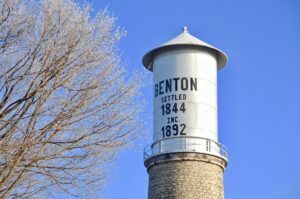 The Village of Benton’s website, http://www.bentonwi.us, was made possible through an Alliant Energy grant written by the BCDC and through collaborated efforts between our organization and the Village. The previous Benton website was developed by member Steve Calvert, who was the site’s only webmaster since its inception several years ago. Labor Day Street Dance and Celebration. Benton has been celebrating Labor Day since 1897 when the First Annual Union Basket Picnic was held. Labor Day festivities are sponsored by the Benton Fire Department and, though they no longer include picnic basket lunches, they do include a pasty dinner that is attended annually by hundreds of people—many traveling from some distance to enjoy the traditional “meat-and-potato pie.” Labor Day is kicked off with a morning parade that is followed by amusement rides, concessions, bingo games, and musical entertainment in the park. The evening is wrapped up with the annual firemen’s raffle drawing and fireworks at dusk. Because scores of people come home to Benton for the Labor Day weekend, the BCDC saw an opportunity for old friends and classmates to get together for an evening of dancing and reminiscing . . . and so the Benton Street Dance was born. The Street Dance takes place on Sunday evening of Labor Day weekend and currently attracts between 1,200 and 1,500 people each year. The dance is the BCDC’s largest fundraiser of the year, providing most of the funds that allow the organization to fulfill its mission. Flower Planting. Each spring the members of the BCDC plant flowers in the highway-median area on the west edge of town. Dedicated as the Milton B. Wiseman Memorial Park, the “island” is filled with blossoming flowers during the summer months and welcomes travelers coming into Benton on Hwy 11 West. The Holidays. During the Christmas season, the BCDC decorates and illuminates the Hwy 11 median. The organization also sponsors the sale of holiday wreaths and buntings. The BCDC-sponsored “Tree of Love Ceremony” is an annual part of the Christmas season. Family members and friends purchase memorial decorations that are placed on the Tree of Love. The tree is lit and each memorial name is honored during the ceremony. Welcome Signs and Memorial Plaques. Benton has two impressive signs on either end of town that welcome visitors to our community. The BCDC, in collaboration with the Village, helped to provide funds for the purchase and installation of the signs. In addition to the welcome signs, the organization purchased and installed plaques at the east end of the Milton B. Wiseman Memorial Park in honor of our area’s veterans. The BCDC also helps fund the annual flower displays for the Wiseman Park median. Benton High School Alumni Directory. The BCDC has compiled and published a directory of the names and—where applicable—addresses of all Benton High School graduates, dating from the first graduating class in 1900 to the class of 2007. Requests for address information may be obtained by emailing the BCDC at [email protected]. Any Benton graduate who has address changes to make, may do so by using the same link.